We as grandparents love our grandchildren and during the holidays we often get to show that love through gifts. I have always said, darlings, it is about what you leave them in their heads, not their bank accounts and the same is true when it comes to gifts. A gift does NOT need to be expensive to be perfect for your grandchild. Below I am offering some ideas for holiday gifts for grandchildren. Teaching gratitude to my grandchildren has been crucial. That’s why one of my go-to gifts for my grandchildren is thank you notes. You can take it one step further and go with stationary. This doesn’t have to be a gift for older grands. If they can write, they can send a thank you note with the help of their parents. As you may recall, I am a big fan of giving gifts that encourage writing. In my post on gifts from the heart I suggested a journal. If your grandchildren are younger and need no more toys (because really that happens quite often) consider clothes. I know what you are thinking dear readers: You don’t want to be the boring grandmother that gives clothes. SO DON’T GIVE BORING CLOTHES. There are so many brands that make such fun clothing that if your grandchildren don’t appreciate it your children will. If none of these are what you are looking for, check out full collections at Monica + Andy, Peek Kids, Cat & Jack, and Tea Collection. And now for a fun fashion idea. I love bangle bracelets. 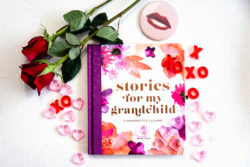 If you have grandchildren who are young women this is a very trendy gift that you can give in a variety of ways. From bold enamel bracelets to delicate wire with a charm, these are costume jewelry pieces that the young women in your life with appreciate. What do you love to give your grandchildren? Please share on my Facebook, Twitter or in the comments below. The word “stationery”in the article was misspelled as “stationary..”Thought you would want to know for future articles . Gosh because I have so many grands, I hope it’s ok I stole this from you. I love that more than grandkids or children or even babies. I tend to do gift cards, because they especially the older ones that what they want. My granddaughter just turned 17 in October she wanted sephoria gc so that is what she got. But sometimes I get things like beach things, towels, goggles, beautiful head bands or bows, clothes, ect. My grands range in age of 24-18 months, and I have 16! Blessings to you .